Everyone loves cobbler. It’s one of those scrumptious desserts that we find ourselves eating for breakfast the next day and “rounding off the edges” until there’s nothing left. This recipe almost didn’t make it to my store menu because I thought it not worthy (too pedestrian and way too easy). I’m glad I caved, because it was the belle of the ball every summer! 8 Cups Canned Peaches – drained of course you can use fresh if you so desire! Bake uncovered at 375° 45-60 minutes or until golden brown. I like the easy ones – I’m pretty reactive when it comes to cooking. Whatever I saw last sounds good to me, so it helps if it doesn’t take a lot of prep time. Perfect!! It’s right in the middle of peach season. Perfect!! Fred LOVES peaches. His birthday is today!! His mother would always can a crate of peaches for him for his birthday. What Pat forgot to mention is that my mother also made me a pint of peach preserves every birthday. On one birthday Pats mother, Zetta , was visiting when mom delivered the peaches. I was out doing farm work, antcipating some delicious peach preserves for dinner. Pat and Zetta decided to sample the preserves with some fresh homebaked bread. Apparently they thought it was good also, because they sat there and ate the whole jar!! I was more than just a little annoyed. How cool! 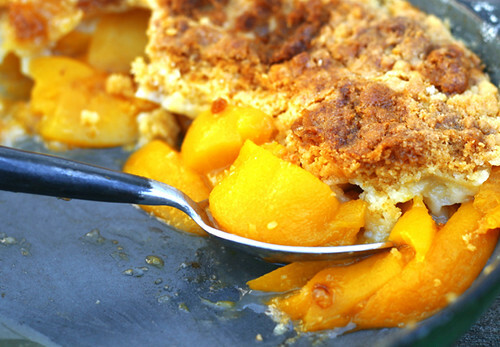 I’ve never heard of cobbler made with cake mix, but this sounds great! I’d love to be able to throw this together for a quick summer dessert.